On Tuesday, the national team accomplished their mission of registering another three points on the road in a far flung Asian nation. While most fans expected more goals- a lot more- the result keeps Palestine atop of Group D and one result away from becoming the first team to qualify (from teams in this qualifying round) for the Asian Cup finals in 2019. A first half that saw plenty of pressure but no end result will leave Abdel Nasser Barakat with a lot to mull over. The tactician intimated as much in the post match press conference crediting the Bhutanese for making life difficult for his side. Below are our ratings for the performance of all 13 players that participated in the victory. 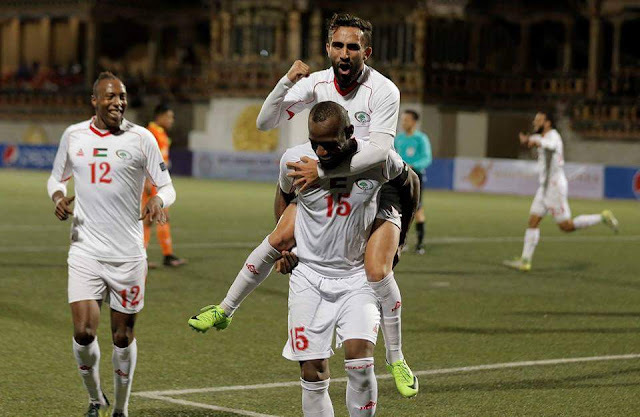 Abdel Nasser Barakat (5): Mission accomplished through three games but Palestine were made to sweat tonight against a team they were better than in every conceivable way. Barakat has given a very long leash to Tamer Seyam, who, through three games has not replicated his WBPL performances or his form against Malaysia in the last round. Similarly, Sameh Maraba has been favored in all three games against the likes of Ahmad Maher- who rescued the team in Malé. The only player providing some structure in attack was Jaka Ihbeisheh- he also had created and nearly finished the best chance of the game before Yashir's opener. Once he exited the attacking midfield became an amalgamation of three individuals trying to do everything by themselves. Put simply, the tactician's substitutions in the last two games did not serve to strengthen the team. After falling out with Ahmed Abu Nahyeh (his gestures after scoring against Maldives seem to intimate that he thinks he should be starting) he has not found a striker to effectively spell Yashir Pinto Islame. Against Oman, he played Ahmed Maher out of position and the team had no outlet to hold the ball up. Today, he bizarrely favored Khaled Salem over Matías Jadue and the hold up play disappeared yet again. A team that can call upon the services of Jadue, Eid, Awad, and Abu Nahyeh should not have to rely on Khaled Salem. The Khaled Salem project seems to make a comeback every two years but the man is 28 years old- he isn't raw anymore- he is what he is. Some difficult decisions need to be made in the next 18 months. Players cannot expect to hold onto their starting positions if they don't play well- the onus is on the coach to find the right role for each player. Right now, two of his favorites are simply not preforming.